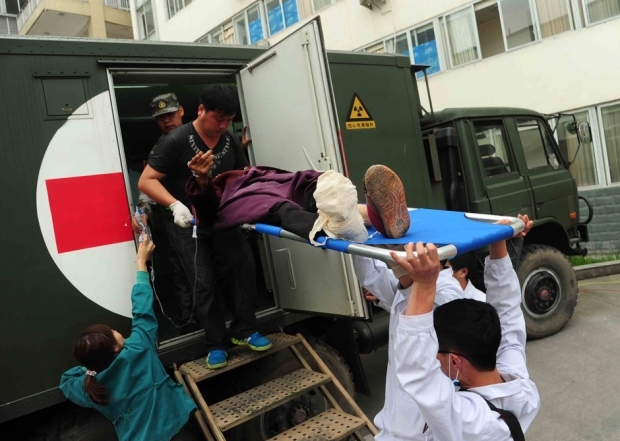 Chinese medical personnel move an injured resident in Longmen township, after an earthquake hit the city in Ya’an, southwest China's Sichuan province on April 21, 2013. This story by staff reporter Lan Fang was first published by Caixin. Two box lunches—and nothing more. Yuan Yue says that’s what the Red Cross Society of China has frugally handed out so far to each member of a special committee assigned to investigate the charity group’s finances. But critics of the special board called the China Red Cross Society Supervisory Committee, on which Yuan has served since it was formed in December under State Council orders, fear that collusion has infected the oversight process in ways that go far deeper than free meals. The directive followed a scandal that rocked public confidence in the Red Cross, a government-backed but non-profit agency that, like the international organization with the same name, provides a range of services from flood rescues to post-disaster shelter to blood drives. It’s China’s biggest charity, collecting 3.3 billion yuan in cash donations in 2010 and spending about 2.5 billion yuan that year, according to the society’s financial report. Red Cross Society employee pictures with a fancy sports car caused a flashpoint in Chinese social media. At the center of the scandal was a young woman named Guo Meimei who allegedly worked for the Red Cross but earned outrageous wages, raising the public’s ire over claims that charitable donations had made her rich. The story of Guo basking in a luxurious lifestyle became an Internet sensation after social networks posted photos of her posing with a fancy sports car. The affair, which authorities later found was exaggerated, undermined public trust in the Red Cross. So it was the committee’s job to help rebuild that trust by analyzing and cleaning up the charity’s accounts, among other tasks. But the committee itself came under close scrutiny, and soon critics of the Red Cross had found reasons to question the integrity of each member. Some were accused of using their personal connections with Red Cross officials to cut lucrative business deals. And the committee as a whole was charged with functioning as no more than a “public relations agency” for the scandal-racked charity. Lingering distrust of the Red Cross was apparent in April, when the agency’s every move was critically analyzed by the media and public during disaster relief efforts following an earthquake in Sichuan Province. Red Cross officials were granted the power to pick each committee member, and then picked up the tab for all its work, including expenses tied to investigating the charity’s books. Critics say the arrangement made it impossible for the committee to function independently and, thus, get the Red Cross back on track financially and in the public eye. Indeed, the Red Cross’ credibility has yet to recover from the Guo Meimei incident, which started in June 2011. Actually, authorities who investigated the incident determined it was a tempest in a teapot. The woman, they found, had neither a direct connection to the Red Cross, nor did the luxury car and other goods she flaunted online come from charitable donations. But officials did find that Guo has connections with a Red Cross marketing affiliate called the China Red Cross Society Commerce System. This discovery intensified public criticism of the charity. After the committee was formed, some members said the Red Cross’ first order of business was to restore its credibility by filling in the public relations gap connected to the Guo Meimei incident. They concluded, for example, that the 2011 government investigation had not restored public confidence. Some members called for re-opening the investigation and focusing on the activities of the marketing affiliate as well as other agencies operating under the Red Cross umbrella. Moreover, they argued that Red Cross officials should reform by, for example, overhauling their financial management mechanisms. Among those critics was committee member Yang Tuan, who works as a scholar at the Chinese Academy of Social Sciences. He says the Red Cross violated the public’s trust, and at the root of the problem is an opaque, inefficient bureaucracy. The bureaucracy has for years leaned on its government-granted administrative powers to organize and finance charity projects, but without oversight by any other government agency. Contracts for these projects have been awarded to companies that established relationships with the Red Cross. For example, Red Cross funds were used for operations tied to the marketing agency and its director. The special committee’s 16 members work in the fields of law, finance, communications, medicine and emergency services. They were given several responsibilities, such as overseeing project spending and financial receipts, including donations; making the committee’s annual or special reports available to the public; surveying the public for overall views toward the Red Cross and its work; and advising the agency on strategy and planning issues. But the committee had barely gotten off the ground when critics started focusing on the member-selection and payment procedures. Skeptics said the committee's independence could not be guaranteed given the way members were selected and because operation of the committee was financed by the Red Cross. Additional questions posted on the Internet took aim at individual members of the committee, accusing some of accepting the position inappropriately because of their close relations with the Red Cross. The first shot was fired at Wang Yong, the committee’s spokesman and secretary-general of the Brand China Industry Union, a semi-governmental organization focused on promoting domestic brands. The union in May honored a Red Cross official, Vice President Zhao Baige, with a China Top Ten Brands Woman award, which is given to the nation’s leading businesswomen. Zhao’s award led to public questions about Wang’s ability to work independently on the committee. Next to stand in the cross-hairs was Yuan Yue, chairman of the Horizon Research Consultancy Group, a company that was hired by the Red Cross to conduct project assessments. For its services, Horizon earned 60,000 yuan in 2012. Then Wang Zhenhui, a former Ministry of Civil Affairs official and dean of Beijing Normal University, was questioned because of his connections to One Foundation, which used to be closely connected to the Red Cross. And Zhang Yong, head of the Blue Sky Rescue Team, a non-governmental disaster relief organization affiliated with Red Cross, took heat for serving on the committee despite his close work with the charity. Committee members worked hard to defend themselves. Wang, for example, issued a public apology on June 2 in which he said it was improper for him to give the award to Zhao. But he has continued serving on the committee. Yuan admitted he had failed to properly consider his special interest, then said he had returned all funds to the Red Cross and promised all future consulting by his firm for the Red Cross would be gratis. Moreover, he said, his firm had imposed a three-year moratorium for Red Cross-related projects. Meanwhile, philanthropy experts are recommending the Red Cross and the supervisory committee tread more carefully. Xu Yongguang, chairman of the non-governmental charity the Narada Foundation, said the committee members’ firms and organizations should avoid all commercial cooperation with the Red Cross. Tsinghua University School of Public Administration Associate Professor Jia Xijing said relations between the Red Cross and the committee members should be examined closely, and it should be clear that each can properly carry out his or her oversight duties. A first step in the process, he said, should be to set up mechanisms for information disclosure and a means for avoiding conflicts of interest. At a recent committee meeting, members responded to critics by agreeing none would accept remuneration from the Red Cross while they served on the board. They also promised not to participate in any projects commissioned by the Red Cross or provide paid services to the organization for one year after leaving the committee. But these pledges did not silence all discontent. For example, some critics continued to question the committee’s ability to act independently, based on the fact that Red Cross is covering all their expenses. Yuan said, however, that covering expenses so far has merely involved the Red Cross paying for “only two box lunches” per member. He said in other countries, though, that similar committees are financed through independent sources. A committee member who is also a popular host for TV news programs, Bai Yansong, donated 50,000 yuan from his own pocket to support committee operations. Nevertheless, the committee has remained closely tied to the Red Cross. Yang Tuan says the committee has limited power. If members spot a problem, he said, they can do little more than ask the Red Cross to launch an investigation or hire an auditor. Indeed, after the committee discussed the possibility of reopening the Guo Meimei incident, members voted against conducting an independent investigation. They instead recommended the Red Cross and relevant authorities launch a fresh probe if new evidence comes to light. Jin called the committee a “trailblazer” that’s been given responsibility to build a platform and mechanism, as well as write up standards of measurement, for overseeing the Red Cross at various levels. After six months of operation, Yang said committee members have reached some key decisions. They agreed, for example, that they would not provide simple oversight nor investigate individual problem areas. Rather, members decided the committee’s function was to serve as a “professional bridge” between the Red Cross and others in the general public and the media. Committee members have thus been assigned to field questions from the public and provide answers. In the process, they are supposed to disclose all relevant information. Final analyses would thus provide a framework for professional suggestions that help the Red Cross reform its operations. Some scholars familiar with the committee’s work see it as a transitional platform that can help promote long-range reform for the Red Cross. It is hoped that one reform step would be to establish a truly pluralistic oversight mechanism that sets clear boundaries for legal oversight of the Red Cross, and pushes the charity to establish an independent, third-party assessment mechanism tied to fully public disclosure of information, while at the same time forming a system for proper oversight.